I enjoy learning and discussing personal finance. 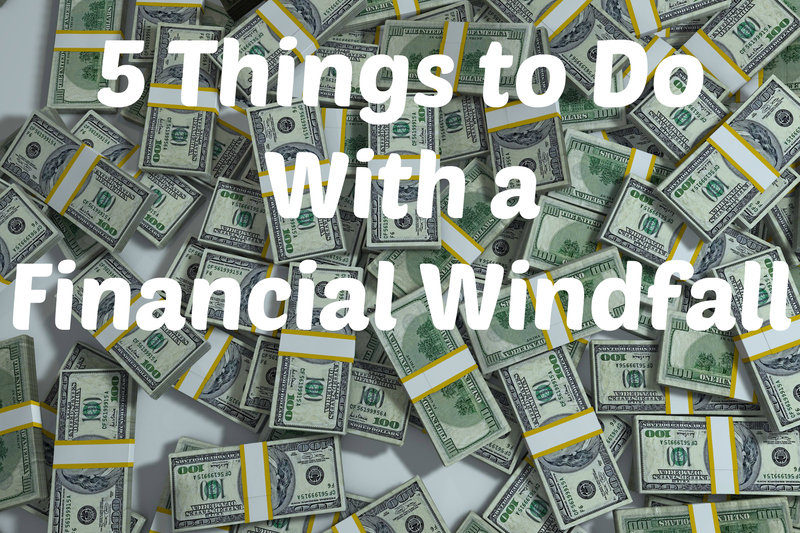 The day-to-day things like budgeting, credit decisions, debt repayment. Where I start to get a bit intimidated is matters of investing. 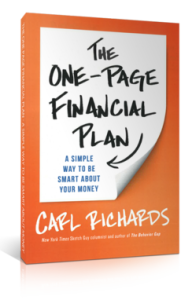 So, I admit, when I learned that The One-Page Financial Plan was written by financial planner, Carl Richards, I was a bit apprehensive about reading it. Once people start talking stocks, bonds, derivatives (blah blah blah), I totally shut down, and I had no clue how to avoid the ‘shut down’ when I have to review the book! I think I spent a few days just poking it with a stick. Once I finally got over my fear of touching it, upon a quick glance, the first thing that stood out to me was that One-Page Financial Plan was around 200 pages long. That alone made me feel a little less intimidated. Also, as I flipped through the pages, I noticed there were a lot of very simple sketches and some on napkins (Yes – even less reading) and I felt even a little more comfortable taking it on. What was really helpful was actually reading the books tagline: A Simple Way to Be Smart About Your Money. As I read through the pages, the one thing I felt very confident about, is that the author delivered on the tagline. My goal in writing this book is to pull the curtain back a bit: to show you how real financial planning works, to give you an experience of what it’s like to work with a real financial advisor. Whether you’re working with an advisor or on your own, this book will help you understand the basic steps for creating a personalized plan that takes into your account your unique values and goals. Boy was I pleasantly surprised and never more happy to be wrong! It is evident from my fear that I had no idea how real financial planning works … I mean, they don’t just start talking about stock options? Firstly, I really like the author’s writing style. It is very simple, making the subject matter approachable. 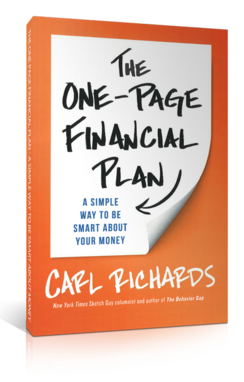 Secondly, he does a great job of walking the reader through the steps of making an individualized financial plan without making it seem like a rudimentary to-do list. Each step is wrapped in relevant stories and makes sure to delve into the reasoning behind making choices. In One-Page Financial Plan, the author talks about his own financial missteps, and I really appreciated the humility and openness. And I have to tell you, he does eventually get to the bad ‘i’ word – investments, and it wasn’t painful! I didn’t scratch my eyes out and I didn’t just close the book and figure I’d ignore writing about it in this review. Just like the rest of the book, what he does share is done in such a way that anyone can understand. It wasn’t bogged down with jargon and really helped me to feel more confident with investments going forward. Also, he doesn’t tell you what to do, but he does give the reader really good guidelines to do what’s best for their unique situation. 2. I want to make sure my values and my goals align. It’s clear to me know how those bump up against each other in my life. 3. As with everything else … as we’ve always known … discipline is key. A lot of times, in areas like finances, the problem is that we know we need to get to point B but we just need some guidance to get there. For anyone, in any financial state, One-Page Financial Plan will help you to do that. After reading it, I felt like some of the jumbles in my mind got sorted out. I guess that’s what a financial advisor is supposed to be able to do for a client. Mission accomplished. Carl Richards is a CERTIFIED FINANCIAL PLANNER™ and the director of investor education for the BAM ALLIANCE, a community of over 130 independent wealth management firms throughout the United States. He is the creator of the weekly Sketch Guy column in the The NY Times, and a columnist for Morningstar Advisor. Carl has also been featured on Marketplace Money, The Leonard Lopate Show, Oprah.com and Forbes.com. Keeping your personal finances in order can be a difficult task. Do not feel like you need to give your hard earned money to any financial professional. This article offers simple solutions that will help you make sure your bank accounts and credit score stay in good financial standing. Fund your retirement account heavily. Make sure that you are at least put in as much as your company will match. More than that is even better. Planning for retirement now will keep you from worrying about it later. You will have a nice nest egg and be able to live comfortably when you reach retirement age. An IRA is a great way to supplement your employment or other retirement plans. IRA’s are generally not as limited as far as types of investments as 401k plans are. If you have the money available, start an IRA as a supplemental vehicle for retirement on the side. It will greatly benefit your future. Start saving for retirement. This can seem like a far way off, but every penny you put away for your retirement now is another penny you won’t have to earn when you’re older, less interested in working and less able to work. Start saving now so you can relax later. Just because the economy is down, do not stop investing money in your 401(K) or other retirement accounts. While it may be a little tempting to stop investing at that time, you have to keep in mind that sometimes, more money is made at the bottom of the market than at the top. No personal financial plan is complete without a long term goal for future financial security. 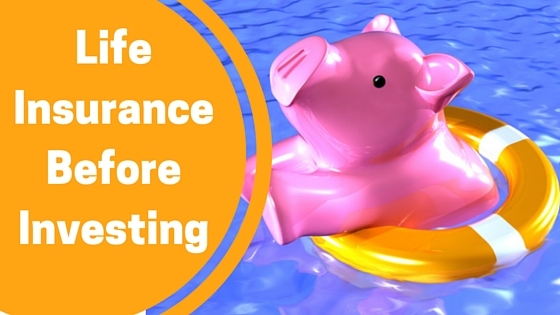 Developing a program to contribute to a retirement savings plan will provide you with peace of mind and the confidence that you will be able to enjoy life after your retirement. Set a goal and stay with it. There is no need to be worried about the state of your personal finances. This article offers many easy fixes for any of your money problems so you can take care of things without needing the help of a professional. Once you get your financial records on track, it will be effortless to keep up. How Much Do You Plan to Rely on Social Security? It sometimes seems as if we get hit with yet another of those “Social Security is going broke” scares at least once a year. Is that what is really happening? If it is, what can you and I do about it? Is Social Security Really “Going Broke? There is absolutely no question that there are serious flaws in the Social Security funding mechanism – or should I say Social Security assumptions? From an actuarial standpoint Social Security has been a developing fiscal train wreck for decades. 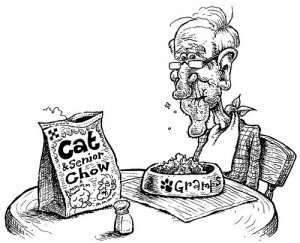 The retirement age was set at 65 way back in 1935, when the average person lived to be…about 65. Today, almost 80 years later, the average person is now living to be about 80. That means the average person can expect to collect Social Security benefits for about 15 years. To make matters worse back in the early 1970s, the government created an early retirement provision that allowed people to begin collecting reduced benefits at age 62. That just advanced the train wreck. There have been a steady series of increases in the Social Security payroll tax since the Carter administration days. Then under the Reagan Administration, a trust fund was established that would direct at least some of the payroll tax into the fund as a reserve against swelling expenditures expected as the Baby-Boom generation would begin entering retirement. None of the efforts have completely kept up with expenditures, and projections are now showing that the Social Security trust fund will be exhausted sometime in the 2030s. That means 20 years into the future, which will affect the retirement plans of the generations coming up just behind the Baby Boomers. Other projections have the Medicare trust fund being exhausted as early as 2016. That would be a bigger problem than Social Security going broke, but that’s an entirely different topic that we will not examine here. The Federal government’s budget is different than yours or mine. Businesses have formal balance sheets and individuals have informal ones. It’s a tally of assets minus liabilities equals capital, or net worth. The government – especially the federal government – doesn’t operate that way. It isn’t restrained by budget shortfalls in the same way that you or I or a business could be. Government borrowing. The government can always borrow money to make Social Security payments. And as we’ve seen in the past few decades, this neatly fit’s the governments M.O. (modus operandi). Money printing. If the government cannot borrow enough money to meet its bills, it can always print more. It will do this with Social Security failing all else. Governments have done this for thousands of years. Recent evidence proved that the Roman Empire, under Nero, debased their silver coins by putting iron plugs in them. Coins that were trading based on their silver content, were in fact just 80% silver and 20% iron. This enabled the government to issue more silver coins than they had silver to mint. And so it has been ever since with governments all over the world. And the citizen reaction? They mostly don’t care as long as they get paid. The US is already “broke” but we keep chugging along . The United States government has been operating with increasing deficit levels for most of the past 40 years. In addition, the level of official national debt is now higher than the country’s total economic output. The US has been spending more money than it earns for at least half a lifetime – what we would call being broke – and yet the checks are still going out. We should expect no change on this front, and that includes the future of Social Security. 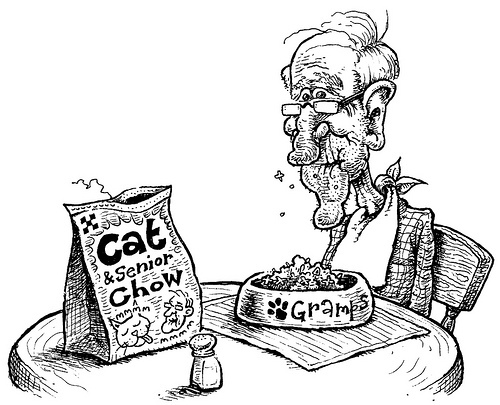 Our Social Security benefits will be paid in inflated dollars, meaning we will have less purchasing power. Benefits will be gradually reduced, so slowly that we won’t notice it, but we will still end up with less money. The retirement age will be increased. This is already happening as the age for collection of full Social Security benefits is being gradually increased from 65 to 67. Expect the age bar to be set higher. More Social Security benefits will be taxable. We should expect that 100% of Social Security benefits will be taxable in the not-too-distant future. Right now benefits are only partially taxable above a certain income threshold. It’s not inconceivable that we will see all four solutions implemented, plus one or two more than we can’t even imagine at this time. All will produce the same result – lower Social Security benefits than we currently anticipate. All of that is big picture stuff, and there’s not a whole lot that we can do to change it. But we can change how we react to it, and that’s where our action on this issue has to be concentrated. Plan on a less lucrative retirement. If you are planning on a full-fledged retirement living in a condo on a golf course, you might want to scale that back to something more modest. Double your efforts to save for retirement. Whatever percentage of your income you are saving for retirement, plan on consistently increasing it as you get older. Savings will be one of the best protections against reduced Social Security benefits in the future. Plan on working as long as you can. This doesn’t mean working at a full-time job until the day you drop. But plan to have at least a part-time career or business you can tap as an additional source of income. It can even be something casual or seasonal on an as-needed basis, but be ready with something. Cut your living expenses as much as you can. Aside from scaling back your retirement lifestyle expectations, plan on cutting your living expenses across-the-board, both now and in retirement. That will mean less income will be needed when you retire, and more money for retirement savings between now and then. Trust in God. Every one of us came into this world as a helpless baby, and the only reason that we’ve reached the age that we have is because God has had his hand on us. Expect that to continue, even into retirement. In the end, our faith in Jesus Christ is our best and only security. He’s seen us through worse in the past, and he’ll see us through this to. No matter what we hear from the media, the sky isn’t falling – at least not as far as Social Security is concerned. However, do anticipate some stormy weather. What do you think the future of Social Security will be? Do you think that it will be there when you retire?